As a city that loves our hockey team, it’s easy to forget about players who may have made a huge mark while they were with us, but are now out of the picture. These ten memorable Canucks have been keeping busy since their years of leaving. 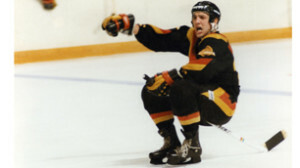 Tiger Williams played for the Vancouver Canucks from 1980-1984, where he got his third highest penalty minutes in a season, reaching 343. Williams was definitely an enforcer for each team he played for. Williams has done pretty well at maintaining under the radar since his NHL retirement in 1988. In 1993, he briefly appeared in 2 games of roller hockey before calling it quits. In 2012, Williams participated in the Hockey Hall of Fame legends game, and made snarky remarks of hockey’s evolution in a 2013 story in the Province. Valk first started with the Canucks in their 1990-91 season, and stuck with them until their 1993-94 season when he parted from the ‘Nucks and headed down to Anaheim to play for the Mighty Ducks. 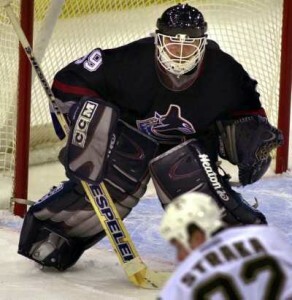 Although Valk played for five teams in his NHL career, his heart remained in Vancouver, where he settled down with his family and pursued a career in broadcasting for Rogers Sportsnet. Valk now coaches his son’s North Vancouver junior hockey team. Vancouver really is a hot-spot for former Canucks. Retired goalie Kirk McLean is back in Vancouver after also playing for five teams in the NHL, including Alain Vigneault’s current team, the New York Rangers. McLean took a different post-career approach after concluding his NHL career, and decided to jump into the restaurant business. As of 2010, he became the owner of McLean’s restaurant in Gastown. McLean is also an avid golfer, being a member of the Marine Drive Golf Club (cue Canucks golfing jokes). 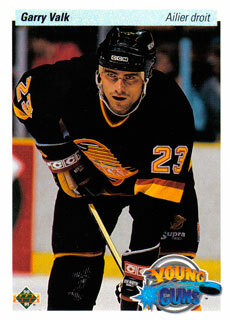 Darcy Rota is a Canucks favourite, seeing as he was born and raised in Vancouver and finished off his NHL career here. 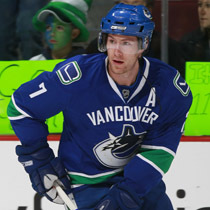 Rota played 11 seasons in the NHL, five of which were with the Canucks. Not only was Rota’s NHL career impressive, but his management career post-retirement is as well. After his 1984 retirement, Rota pursued a career as director of player development for the Vancouver Canucks, assistant to league president with the NHL and his current roles as co-owner, president and general manager of Junior A team the Coquitlam Express. 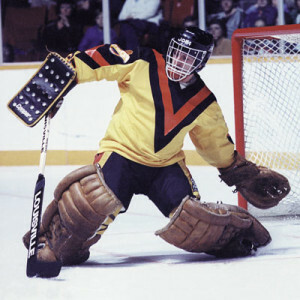 Quebec native Richard Brodeur was a goaltender for the Canucks from 1980 to 1988 and had the not-so-flattering record of being the goalie whom Wayne Gretzky scored the most on (29 goals). Although this particular record wasn’t anything to boast about, his overall career was impressive, being selected for the NHL All-Star game in 1983, and leading the Canucks to the finals for the 1982 playoffs. As opposed to the typical pursuing of a hockey-related career post-retirement, Brodeur is now an artist based in Vancouver and has had shows at Diskin Galleries. 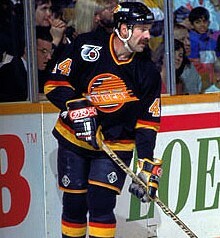 The original number 44, Dave Babych had an impressive NHL career, playing a total of 19 seasons. 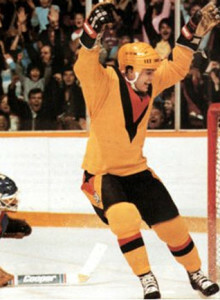 Babych spent seven years in Vancouver, where he became the first Canucks defenseman to score a hat trick during regular season. Babych’s retirement landed him his residence in North Vancouver, where he become an assitant specializing in defencemen to director of player personnel Dave Gagner. Babych also became a member of Athletics for Kids in 2002 and remains involved as a director and public ambassador. Babych has also spent the last 15 years coaching baseball and hockey at a variety of levels. Oh Nazzy. How we love you. 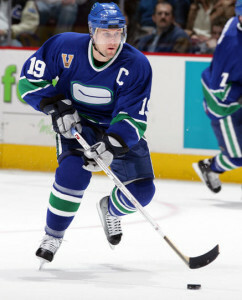 Former captain of the Vancouver Canucks Markus Naslund had a long-running Canucks career stemming from 1996 to 2008, and was captain from 2000 to 2008. Naslund announced his retirement in May of 2009 while playing for the New York Rangers, which was no surprise. Post-retirement life for Nazzy consisted of moving his family back to Sweden to raise his kids, but he did manage to get some ice time in there. Naslund played for professional Swedish ice hockey club Modo, alongside Peter Forsberg. Most recently, in just April of this year, Naslund was inducted into the Swedish Hockey Hall of Fame. Another key member in a prime era for the Canucks is Brendan Morrison. Although Morrison is still playing, a lot has changed for him since his departure from Vancouver. 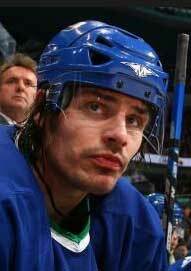 Morrison spent 8 seasons with the Canucks, the longest he had spent with any other NHL team. After leaving the team in which he had arguably the peak of his career, Morrison played with numerous teams such as the Calgary Flames, Dallas Stars, Washington Capitals and most recently the Chicago Blackhawks. Morrison is once again a free agent, as he hasn’t quite found his spot like he did in Vancouver. Morrison now hosts a TV fishing show called Sportfishing Adventures. Another player to go overseas for some ice is Brent Sopel. Sopel had an impressive NHL run, playing from 1998 until 2011. Sopel played with the Canucks froom 1998 until 2005 when he was traded to the New York Islanders for a short stint before going back to the Canucks in 2007. Sopel left the NHL in 2011, when he announced his contract in the Kontinental Hockey League. 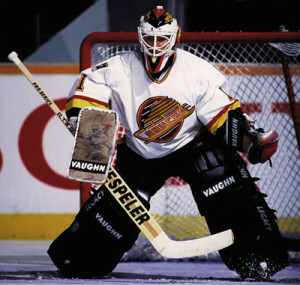 In Cloutier’s longest NHL stint, he sure made a name for himself in Vancouver, having three consecutive 30-win seasons. Cloutier peaked in Vancouver, and his downfall became most apparent in 2008 when he was traded to the Los Angeles Kings. Cloutier’s consistent injuries eventually led to his retirement in 2009 due to chronic injury problems. Cloutier is now spending his time goalie coaching. He was a part-time goalie coach in 2010 for the OHL’s Barrie Colts before returning to the Canucks in September of 2012 as a goaltending consultant.